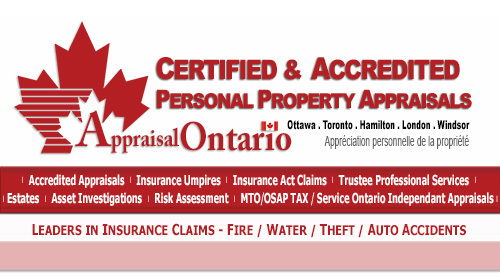 Appoint 'Appraisal Ontario' as your 'Appraiser' for your Insurance Appraisal. We will take over the entire process, resulting in a signed Insurance AWARD! IN MOST cases without going to Court! CALL NOW before you 'sign off' on your Proof of Loss Insurance Claim! matters with a quick, cost-effective solution. * SPECIAL! 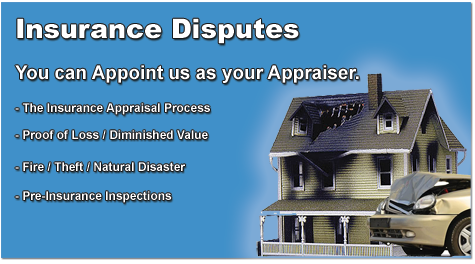 No money Down, we will conduct a full insurance replacement appraisal and will handle the entire process for you. 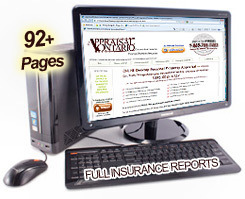 In most cases we can get you an additional 40% then what the insurance company will offer you. We get paid after you receive the Insurance payment from our experience; proven track record and hundreds of satisfied clients. It has been our experience that over 98% of the Insurance proof of Loss Claims get settle without going thru the Umpire process. Fighting a Low Car Insurance Claim Settlement The process of battling a auto - home - business Insurance company over the payment of a claim may not be a pleasant experience, especially when fighting a claim settlement that is too low. This is usually because insurance carriers have much more experience and resources at their disposal when dealing with claims compared to the client. However, if you apply the right steps you can successfully obtain what is rightfully yours from the insurance company. Prepare Yourself when it comes to car insurance settlements, you need to find out all you can about your policy and claim. Your car insurance company will offer you an initial settlement after making a claim, but before responding make sure you understand your policy. Find out what your car insurance claim is worth.Keep all the receipts and add up all the expenses and bills, then calculate all the costs that you have incurred as a result of the car accident; fire or even water damage. The total of this cost will help you determine if the offer you have received is too low or not. The next thing is to figure out your acceptable settlement range. This is an amount that you are willing to accept from the insurance company for the settlement of the claim. You should be prepared to reject any amount lower than your limit. Equally important is the need to know your rights and obtain a total loss appraisal before you start the appraisal process. The Appraisal process under Section 128 of the Ontario Insurance Act starts with a request from either side to start the process. Only a simple letter outlining the concerns from the Client will start this process. It will include the Appraisal Report conducted by Appraisal Ontario and a demand statement to have the other side's Appraiser identified within 7 days of receiving the letter. 1. 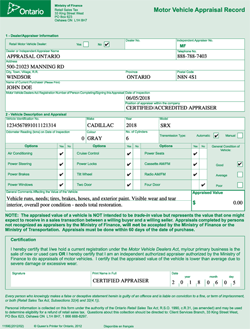 A insurance proof of loss form must be filed or provided to the insurance company before the appraisal process can be triggered. 2. Once both Appraisers have been appointed - moving forward they have FULL AUTHORITY of their respective clients to agree on the finial amount of loss, in accordance with the terms of the Insurance Act. 3. Most cases the first meeting of both Appraisers are done over a phone conference to review their point of view and to identify all issues and reason for the dispute held without prejudice. 4. There is usually a few phone conferences between the 2 Appraisers trying to resolve these issues of the dispute. This method is used to provide full disclosure and an understanding of their evidence and reasons for the dispute. 5. Both Appraiser has the FULL AUTHORITY to bind their clients to a settlement. There is a degree of negotiating between the 2 Appraisers at this time to help minimize unnecessary additional costs to their clients if not reasonably required to do so. 6. Only when both Appraisers cannot come to full agreement, or many times cannot agree to a few issues, then the next step is involving an Umpire to settle these issues. 7. It is important to note that it only takes 2 of the 3 parties involved in the Umpire process to sign a final order. Either Appraiser with the Umpire or hopefully all 3 will sign the finial order.